country skiing has in the UK. I will be relocating to Aberdeen UK this fall. I’m an elderly Cross country skier looking for a place to ski this winter. 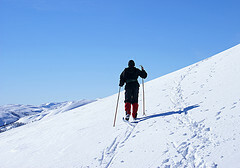 The main cross-country ski area in Aberdeenshire are the Clashindarroch Forest Trails near Rhynie. They are the only X/C ski area that regularly gets trails groomed for classic & skate. We average 40 skiable days a year in the forest. Of there are many other places to ski when there is snow from low-level to the mountains. The huntly Nordic SC is very active & we put on low-key events in the forest We have a base at the Huntly Nordic & Outdoor Centre where there is 300m of artificial mat, a 40m downhill slope & 800m rollerski track. The club meets every Thurs 7;30pm at the Centre & you are most welcome to join to find out more about the club. My name is Christian Ferree and I run a small Adventure travel business, called Direct Adventures, We focus on a slightly more active and sporty approach to worldwide adventure travel. We are launching some trips this year into Norway. We have, however, got a unique slant on our trips in that we are going to North Norway into the wilderness of Finnmark. We ski into the Norwegian Arctic Tundra. This is an area that very few realise is so accessible and offers such a diverse experience. As this is all new, and I am trying to put a group of skiers together who might be interested in joining me for the Recce. I would like to offer the trip at a very good percentage discount, as we must establish the groundwork, but I must also experience the trip as it will be presented to my future clients. I really come to you for help in both ideas as to connecting with the British cross country or Nordic skier and also personally would this be something that would be of interest to you and your fellow skiers? Thanks very much I hope this maybe of some interest to you and I look forward to hearing from you soon. Sitting watching the team sprint from the Nordic World Championships in Oslo on the telly. Think its fantastic to see athletes from Huntly Nordic Ski Club compete, well done!! Live in Värmland region, Sweden myself. Have been here ten years and have understandably learnt to love nordic skiing. Just amazing to see the top athletes. Was wondering if the ski club is ever in Scandinavia to train? Have some contacts if its of interest.